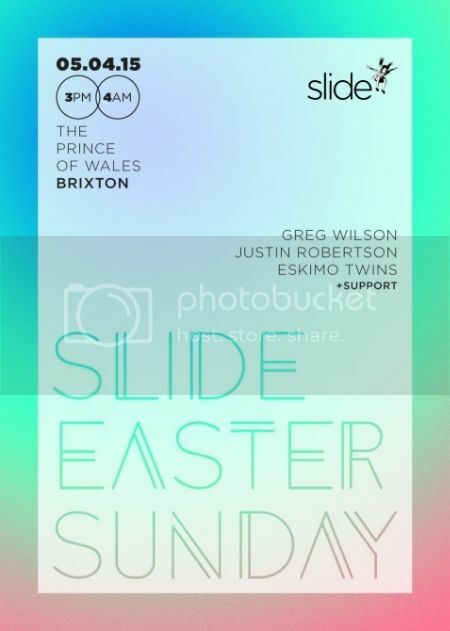 Slide’s first shindig of the summer sees a return to the terrace for the first time since 2011 of the legendary Greg Wilson, spinning for 3 hours, with support across the venue from Justin Robertson, Eskimo Twins and more. Both DJ and producer, Greg Wilson was associated with the early 80’s electro scene in the UK. Two decades on, he found himself a dedicated global gathering as part of the emerging disco renaissance. Originally known for playing funk, soul, disco, and later jazz-funk records, in 1983 he was named North's top DJ, with his nights at Wigan Pier and Manchester's Legend voted the regions best by Blues & Soul readers. That year he became the first DJ to mix live on British TV, put together the first UK re-edit, and taught a young Norman Cook (Fatboy Slim) how to scratch. In 1984 Wilson started producing tracks rather than playing them, debuting with 'UK Electro' for Street Sounds. In 1994 he re-visited his electro-funk past, compiling 'Classic Electro Mastercuts'. As well as being a DJ / producer, Wilson has also written articles for magazines including Wax Poetics, Clash and Grand Slam. The term legend is often banded about far too easily, but in this case it is entirely accurate! Justin Robertson is a producer and DJ, who brings with him a rich history as one of the creators of the Electronic Music scene, as well as a restless need to push forward and innovate, making him one of the most relevant DJs around. Slide regulars the Eskimo Twins warm things up for Justin in the club. Since meeting as students in Leeds, these two friends have shared their passion for music. The pair immersed themselves in the city’s clubbing and live music scenes and after discovering a mutual appreciation of Techno, Classic House, Indie, Acid and a lingering teenage love of Metal; they began making music together. Support across the venue comes from Dom Chung, residents Henry Greenwood, Lloyd Wakeman, Steve Robinson and more.